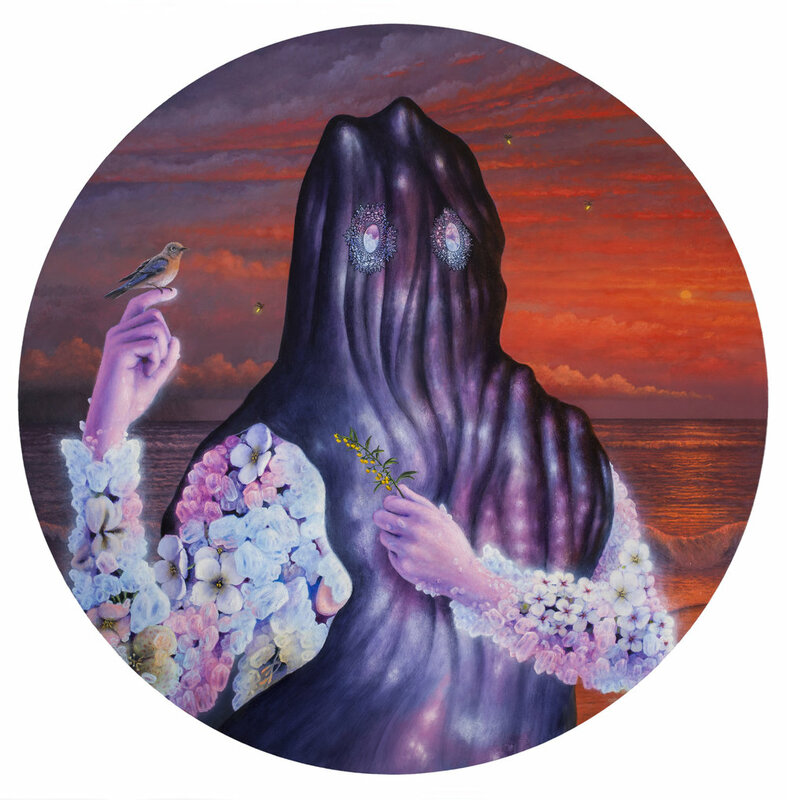 On Saturday, February 24, downtown Los Angeles’ Corey Helford Gallery (CHG) will proudly present a new solo exhibition from painter Adrian Cox, entitled “Terra Incognita,” in Gallery 2. This new series of oil paintings marks Cox’s first solo show with the gallery. In one of Cox’s new pieces, titled "Veiled Healer with Herbal Remedy” (pictured above), the parasol carries a prophetic glimpse of the events that will unfold through the exhibition, and the journey that the Veiled Healer will have to take in to save the Border Creatures from the threat of the Specters (who are seen lighting fires in the background of this painting). The herbs in Veiled Healer's bowl are actual medicinal herbs (chamomile, comfrey, lemon balm, calendula, and St. John's wort), basically a Border Creature recipe for self-care. In addition to Adrian Cox’s “Terra Incognita” exhibition, Corey Helford Gallery will premiere new shows from Herakut in Gallery 1 and Troy Brook in Gallery 3. Opening reception for all three shows will be hosted Saturday, February 24 from 7-11pm. The reception is open to the public and all shows are on view through March 31. Adrian Cox (born 1988) is a painter living and working in St. Louis, Missouri. Cox attended the University of Georgia for his undergraduate studies, and received his Bachelor of Fine Arts degree with honors in 2010. He obtained his Master of Fine Arts degree from Washington University in Saint Louis in 2012, and was awarded the Desert Space Foundation Award upon graduation. Cox’s studio practice involves a continuing exploration of transgressive bodies in figurative painting. Cox has exhibited work both nationally and abroad. His paintings have also been featured in print in Direct Art, International Painting Annual 3, Anatomy Rocks: Flesh and Bones in Contemporary Art, and Hey! Art Magazine, as well as online by Hi-Fructose Magazine, Juxtapoz, Beautiful Bizarre Magazine, and VICE. Corey Helford Gallery (CHG) was first established in 2006 by Jan Corey Helford and her husband, television producer and creator, Bruce Helford (Anger Management, The Drew Carey Show, George Lopez, The Oblongs) and has since evolved into one of the premier galleries of New Contemporary art. Its goals as an institution are the support and growth of young and emerging, to well-known and internationally established artists, the production and promotion of their artwork, and the general production of their exhibits, events and projects. CHG represents a diverse collection of international artists, primarily influenced by today’s pop culture and collectively encompassing style genres such as New Figurative Art, Pop Surrealism, Neo Pop, Graffiti and Street Art, and Post-Graffiti. After nine years in Culver City, CHG relocated in December 2015 to a robust 12,000 sq. ft. building in Downtown Los Angeles, seven times larger than its original space, where it continues to host exhibitions within the heart of the city’s art community. The current space boasts three separate galleries, each of which house individual artist and group exhibitions, whereas the main gallery offers 4,500 sq. ft., providing total immersion for its attendees. New exhibitions are presented approximately every four weeks. For more info and an upcoming exhibition schedule, visit CoreyHelfordGallery.com and connect on Facebook, Twitter and Instagram.